Let’s start off with Friday, or as most people called it “OutKast day”. Lets face it around half the people that went on Friday bought tickets mainly for OutKast, I mean who could blame them. I started out the day with the up and coming band Drowners, which was a refreshing start to the day. Next, it was my third time seeing The 1975 and my best friend got me into VIP for their set so I was pretty much the happiest person alive at the moment. 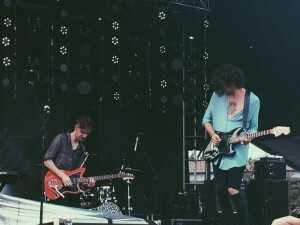 I was a little scared going into The 1975 due to their technical difficulties back at Coachella but seems like they got it all under control because the show went perfectly. Bastille on the other hand was the band with some technical difficulties. I was fairly close to the speakers and I could barely hear the lead singer Dan Smith and his amazing voice. Bastille did an epic cover of TLC’s “No Scrubs”, if on ly I could have properly heard it. Julian Casablancas and The Voids disappointed many as no one really knew any of their songs. People wanted to see Julian Casablancas with The Strokes not Julian Casablancas and The Voids. 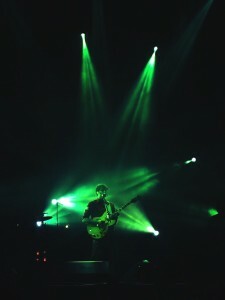 I decided to stay by the stage right after Julius Casablancas and The Voids finished preforming and wait for Phoenix. It was over an hour wait but oh was it worth it. Phoenix have such great energy live and they just make you forget the excruciating leg aches and heat exhaustion. 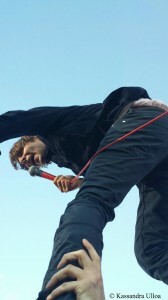 For the last song, Thomas Mars, the lead singer crowed surfed and ended the show literally on top of my friends and I.
Grimes unfortunately played at Gotham Tent, which is the smallest stage of them all so I could only catch a glimpse of her preforming. All I remember is that there were mimes on stage and that the tent was beyond packed. I sat down on the lawn to hear her set and she was absolutely incredible. The most memorable thing about her performance though was when a drunken girl literally fell on top of me and asked me if I was on her level. Nope, I was definitely not on her level, I hope she found her friends and got home safely. Then the moment everyone had been waiting for, OutKast. I had low expectations remembering all those reviews from the first weekend of Coachella but my expectations were blown away. OutKast seemed to have worked everything out because from the moment they walked on stage, they seemed genuinely happy. I heard there were over 20,000 people waiting to see the legendary duo and from what I saw almost every single one of them was dancing and singing along to all of OutKast’s biggest hits. OutKast definitely had a theatrical entrance which set the tone for the rest of the two hour set. Andre 3000 and Big Boi couldn’t stop smiling and enjoying themselves on stage. The highlight of the day for me was just seeing everyone dancing and just having the time of their lives when OutKast was preforming one of their biggest hits “Hey Ya”. OutKast even brought fans from the crowd onstage to dance along to Hey Ya including special guest Janelle Monae. Saturday I woke up late, exhausted from the previous day. I got there just in time for Fitz and The Tantrums who had such a great energy onstage. 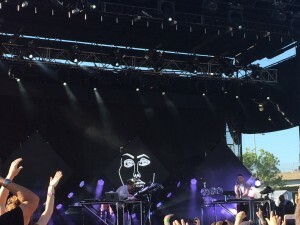 Halfway through their set I walked across the lawn to the Honda Stage where Disclosure would play. I later found out that Madonna and her daughter were backstage watching Disclosure, talk about pressure! I’m still a little bummed out I couldn’t see Broken Bells but Disclosure was so much fun and everyone was dancing and singing along to the British duo. Dancing in the scorching sun for over an hour is not the best thing to do, so I rested on the lawn making sure to gather my energy for The Strokes. People got “creative” when it came toThe Strokes as there were people standing on trees and tables and practically anything else they could find to get a better view. The Strokes were fashionably late but the wait was worth it. Not only were The Strokes amazing, but I ate the most delicious funnel cake I had ever had in my life while watching their set. One thing I was honestly not expecting were the crying girls all around me. From the ages of 16-30 half of the girls were straight on bawling, what an a emotional reunion. The headliners for Saturday were Jack White and Skrillex. Since Saturday was mostly DJs and all around upbeat bands I wanted to continue that spirit by finishing off the night by watching half of Skrillex’s set. I watched Jack White for a little while which was an amazing experience but decided to party with Skrillex for the rest of the night. Everyone was definitely partying that night,maybe a little too much.Walking home on the bridge someone almost threw up on my feet so that basically sums up the party atmosphere on Saturday. Sunday brought bittersweet feelings as there was an amazing lineup but it would be the last day of Governors Ball and we would all have to return to our monotonous lives the next day. My day started off with Banks who called all women goddesses and all men gods and covered one of my favorite songs “Are You That Somebody” by Aaliyah. Next, I got front row for Tyler, the Creator which was amazing up until the last song, “Tamale” where I was elbowed in the stomach during a mosh pit. Tyler and the rest of the Odd Future gang including Earl Sweatshirt, Taco, and Jasper had such great energy on stage and had us cracking up the entire time. I was dying of laughter when Tyler made the whole crowd boo him after messing up a song. My best friend’s nephew came with us on Sunday with his mom and he’s only 11 so my favorite thing about the day were people’s reaction to seeing him. During Tyler everyone gave him space and let him be front row so he could see. When the mosh pit was forming, a group of people formed a barricade around him allowing him to leave unharmed with his mom. There were the occasional jaw drops and rude remarks about him being so young but I think we all wish we were eleven and going to music festivals. I didn’t even go to my first concert ‘till I was fourteen imagine being eleven and going to a festival! I was planning to watch J Cole afterwards, who I’ve loved since I was in middle school but after hearing the first two songs I was truly disappointed. I ended up leaving and went to the silent disco instead. For those of you that have never heard of a silent disco, it’s basically a disco where everyone’s wearing headphones. So if you take them off or record videos it is the funniest thing ever because it looks like they’re dancing with no music playing. Next, came Foster the People who are one of the best bands you can ever see live. They have this energy about them that leave s you dancing and singing a long the whole set without a care in the world. They had a varied set playing some of there classics such as Liztomania where I swear not a single person on that island was not belting out the lyrics as well as some their new songs from their latest album “Coming of Age”. I bravely decided to wait over an hour for Vampire Weekend since they are one of my favorite bands of all time. So as soon as Foster the People finished their set, I made my way up to the front for Vampire Weekend along with hundreds of others. The hour wait was tough but I made some new friends and it was beyond worth it. My review is a tad bit prejudiced since they’re one of my favorite bands but I promise it’s truly honest. If I could only choose one set to relive it would be Vampire Weekend’s. I was looking at the people crying over The Strokes and thinking they were a little crazy but as soon as Vampire Weekend stepped onstage I became a hypocrite because I started tearing a bit too. Maybe it was the fact that this was the final act before the end of Gov Ball or I’m just really in love with this band but the teenage girl inside me definitely came out. In my defense I wasn’t bawling, my eyes only got watery when they first came out and during my personal favorites Oxford Comma and A-Punk. The setlist was more then I could have ever dreamed of, with a good amount of songs from each of their albums and they even included an unreleased song. There was never a dull moment in their set but one of the greatest moments definitely had to be the energy during A-Punk and at the end when Ezra threw more than a hundred $2 bills into the crowd. I’m still not sure if Gov Ball was trying to end the weekend with a pun by making one of the last acts Vampire Weekend or if it was just a funny coincidence. Regardless, I’m glad they ended with Vampire Weekend because I think I got so overwhelmed I ended up going home with a nose bleed, talk about excitement! Special thanks to the kind lady who handed me napkins to stop my nose bleed. Overall it was a bloody good weekend (pun intended) and I will definitely be back next year. The question is, will you?